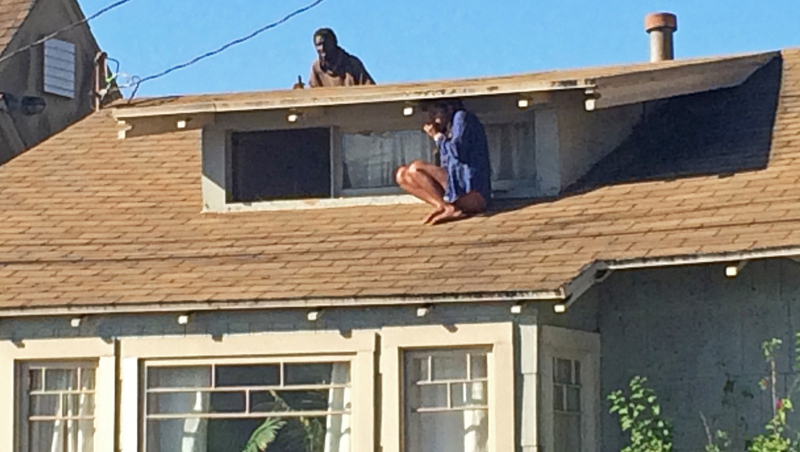 LOS ANGELES, Calif. - A California woman escaped from a home intruder by climbing out of her second-story window and cowering on her roof, reports CBS Los Angeles. Christian Hicks, a 29-year-old man who police describe as being mentally ill, allegedly broke into the Los Angeles home of Melora Rivera Wednesday morning. "He managed to break one of these panels and reach in to unlock the door," Rivera told the station. "Once I saw him in the house, I knew that we both couldn't be there. I knew that I didn't want to have a confrontation with him of any sort, you know, not knowing what his intention was." Rivera, who says she was in bed at the time of the intrusion, managed to grab her phone, call 911 and climb out onto her roof. She hid under an eave as she spoke with the dispatcher. "The drop is, I would guess, more than 20 feet," Rivera told the station. "So there was no safely jumping off the roof or coming down from the roof at that point." Officers soon surrounded the house. "It was my biggest fear was that he was going to be forced by the cops to come hide in basically the same place I was hiding," Rivera said. Bystander Alexandria Thompson saw what was occurring and captured pictures of the event, posting them on her Twitter page. Police said that officers were able to get to Rivera less than two minutes after they were dispatched, reports the station. The fire department, too, responded to the scene and helped Rivera down off the roof as police worked to get Hicks to surrender. Through the pictures posted to social media, residents were able to identify Hicks as a homeless person in the area. One of Rivera's neighbors had reportedly called police on Hicks earlier Wednesday morning for wandering into a yard. Officers had detained Hicks after the previous incident, but were required to let him go since the caller refused to identify him in person. Meanwhile, Rivera says the overall problem of homelessness needs to be identified and addressed. "I think it's very obvious for most of us who live around here, when someone seems to be suffering from a mental illness, and to continue to let these people walk around without offering them assistance, to protect them and us. That, I think, is the heart of the problem." Hicks is charged with burglary and his bail was set at $50,000.